In what follows, it is not question of marls in beds of volcanic origin which are treated with the factual stratigraphy. Of the flood of the continental surfaces. 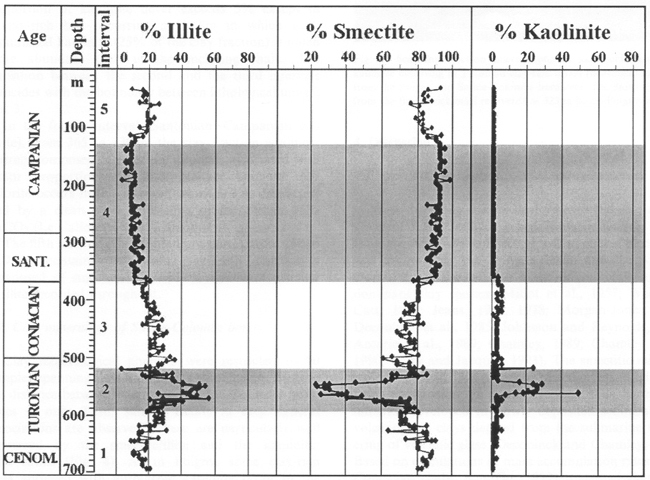 Among clays, the group of smectites (main minerals: the montmorillonite and the saponite) is best represented, as shows him this graph (Deconinck and al ., on 2005) obtained from a drilling at the heart of Paris Basin. A terminal interval Turonien - Coniacien (is reduced towards the summit). In the North of France, certain stratigraphical levels are rich in marly residue and are qualified of "dièves" (ddièves green of Cénomanien lower than means, dièves blue or blue of average Turonien with superior). They establish a waterproof set supporting the aquifer of the chalk. Next to slow variations of the clayey proportion, we register, in Cénomanien and in lower Turonien, fast and periodic variations. They lead to alternations chalk / marl of periodicity décimétrique called "stanzae". The analysis of the outcrops of Ukraine and the of England where stanzae cénomaniens are particularly well developed allowed Mange and al. (1999) to calculate a rythmicité précessionnelle (20ka there modulated by a cycle of short eccentricity (1100 ka). Within the framework of the astronomical theory of the variability of climates, cyclicité chalk - marl still leaves some questioning. In what configuration corresponds, for example, the marly sediment by opposition to the chalky sediment? For Huang and al. (1992), strong thermal contrasts between earth and sea, of low differences of seasonal temperatures, a warm and wet climate produce a strong ground change, contributions terrigènes important and a decrease of the biological productivity. This leads to marly chalks. Conversely, analyses of d18O made by Ditchfield and The Marshall Islands (1989) on cycles chalk - marl show that it is the purest chalks, thus associated with the strongest bioproductivity, that reflect the periods of warmer temperature.